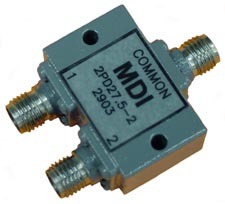 This line of MDI 2-way RF power dividers/combiners cover frequencies from 0.5 GHz up to 40 GHz, with standard input power rating of 30 Watts average, though considerably higher power ratings are available on some models. Standard input power rating is 30 Watts avg. Higher power ratings available on some units. Consult factory.